Gson Annotations Example shows you some useful annotations that are provided by Google Gson, for example: @Expose, @SerializedName, @Since, @Until, and @JsonAdapter. 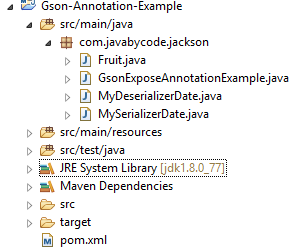 With these annotations, we can customize the serialization of java object to JSON or desirialization of object from JSON. @Expose: this annotation is used to serialize/deserialize a field. This annotation has no effect unless you build Gson with a GsonBuilder and invoke GsonBuilder.excludeFieldsWithoutExposeAnnotation() method. @SerializedName: this annotation is used to serialize a field with different name instead of using actual field name. Sometimes, we need to customize behavior of default serialization/deserialization for our specified requirement. We can do this by writing custom JsonSerializer and JsonDeserializer implementation and registering them with GsonBuilder. @Since: this annotation is used to manage versioning of Json classes. We can serialize/deserialize a field based on its certain version. @Since annotation and version number indicate a field that we can only serialize/deserialize that field starting that version number. Otherwise, before that version, it will ignored. @Until: this annotation is used to manage versioning of Json classes. We can serialize/deserialize a field based on its certain version. @Util annotation and version number indicate a field that we can only serialize/deserialize that field util certain version. Otherwise, after that version, it will ignored. That’s all. Now You can create your own Gson Annotations Example by following all the above steps.